Every time I set up and play Yamatai I am struck again by just how bloody lovely every single part of it is. This is a game that is much participatory art project as it is an exercise in play – at the end of a session you can sit back and feel genuinely a little sad that you’re just going to toss all these vibrant, brightly coloured components back into the box. Were there a more obviously Indian aesthetic to the game I’d make some reference here to it being a kind of board game mandala where the shifting, scattered pieces mirror the impermanent patterns of multi-coloured sand. If there was one word to describe how I feel at the end of my time with Yamatai, it’s wistful. Unfortunately if there were two words, the other would be underwhelmed. Given the game, its style, its mechanics and its primary designer it’s inevitable that it would generate comparisons to the sublime Five Tribes. That’s a shame because this is a perfectly enjoyable game that would have gone down a good deal better with me if I wasn’t primed to expect better. Bear that in mind through this review – I’m sure the score would have been higher had I played it earlier in my life’s timeline. It’s not that they’re the same game, or even that they particularly share mechanics (although they do to an extent). It’s just that it feels like Five Tribes in a whole bunch of ways. 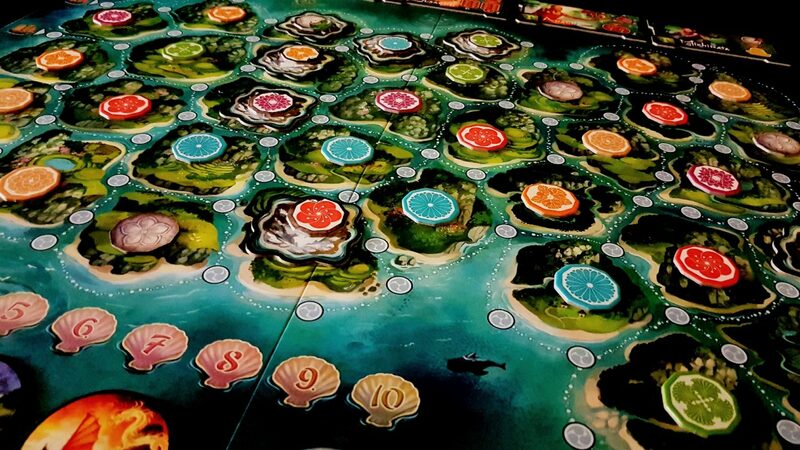 If you took Five Tribes and inverted it you’d have something very much like Yamatai. As such, while it’s not exactly fair to review a game based on how it suffers in a comparison, the simple fact is we live in a deeply, unremittingly unfair world and this is the kind of the thing that happens. It’s also important to consider that I might not be the audience at which Yamatai is aimed. Five Tribes, even on the back of the box, puts itself out as a ‘gamer’s game’ and I don’t disagree with a word of that characterisation. It’s unabashedly cerebral and obviously expects its players to delight in the cleverness of its mechanics. 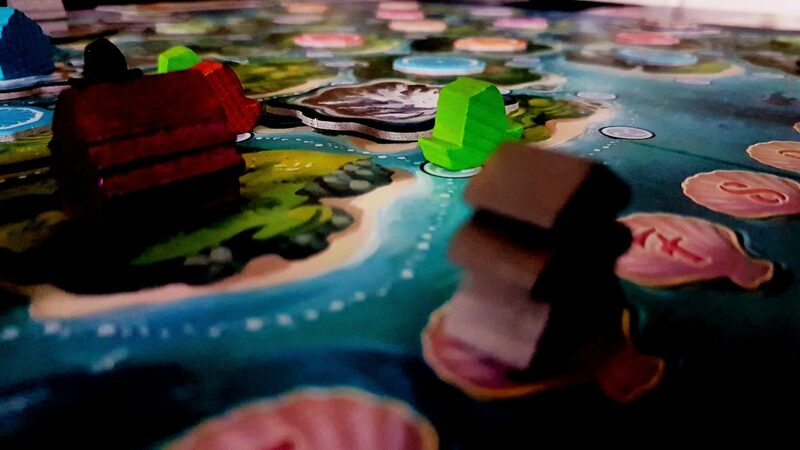 Yamatai has a lot of the flavour of Five Tribes but it lacks the occasionally overpowering preponderance of thick, hefty meat. 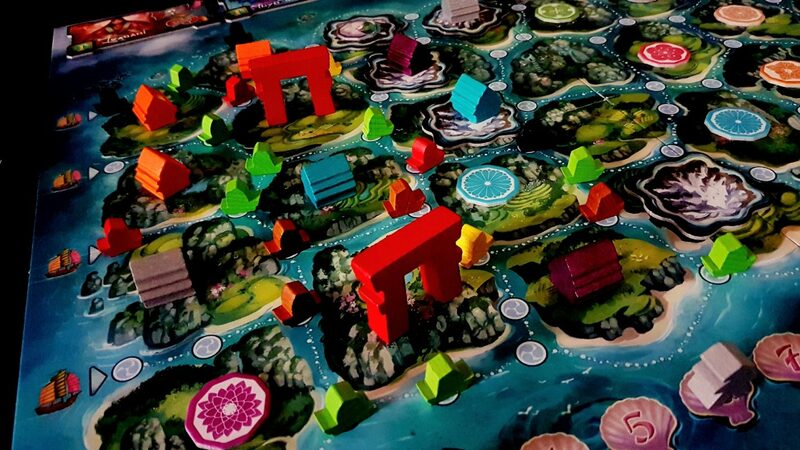 Those that found Five Tribes too unwelcoming in its design might find Yamatai a more palatable experience. This isn’t Diet Five Tribes but it’s close enough in how it feels to play that you could certainly conceptualise it that way and get a fair idea of into what you’re getting yourself. That’s its primary weakness, but it might also be – for some players – it’s biggest strength. I’m getting ahead of myself. 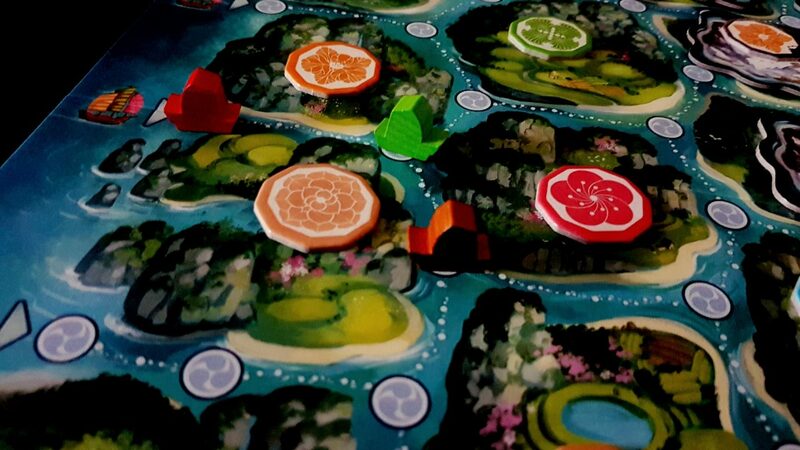 Fundamentally Yamatai is a simple game of placing ships in the brightly coloured configurations that pass for civil engineering in ancient Japan. You might find a tile needs three red boats to be in its waterways, or two brown and a green, or perhaps one of every colour. The more complicated the pattern, the more points the tile will be worth when you claim it. Every turn you pick a fleet tile which gives you a boat and access to a special power that you can use as part of your turn. You place that boat, you score tiles if you can, and then you sit back in the warming glow of a job well done. When you have matched the necessary requirements of a building tile, you claim it and the points it represents while dropping down a building to indicate your dominion over the land upon which it lies. Some placements grant additional points (based on being positioned on mountains or adjacent to religious monuments), others grant coins which can be used to purchase more ships to expand your budding property empire. Dotted around the landscape are culture tokens that must be cleared before building can commence. That’s a chore but those culture tokens can be exchanged for specialists that permit access to an ever increasing library of special powers and abilities you can leverage throughout the game. 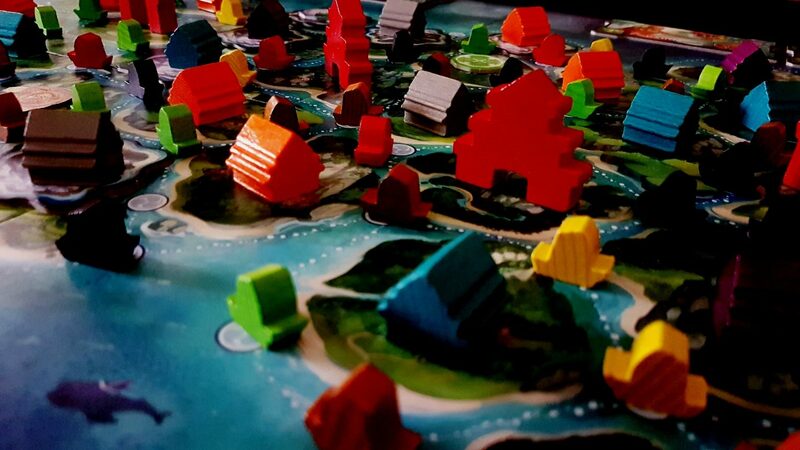 The game ends when all the boats of a particular colour are gone, or all the available buildings have been drawn, or when one player runs out of houses to place, or when there are no specialists left to fill the available slots. There are a lot of ways in which the game ends, and that adds a lot more than simple termination to play. Often during the end-game the act of engineering the conclusion of the game is an ongoing act of bravado and brinksmanship. It’s easy to use up all the red boats when you’re sure you’re in the lead, but that puts the choice of ending the game in the hand of your opponent who may have a different, and potentially more accurate, read on who is winning. It’s easy to miscalculate too and find that you’ve managed to engineer the circumstances under which the game ends before you’re remotely ready for it. Ending the game well is as important as playing it well so you’ll often find players incentivised to pick the fleet tiles that lets them briefly postpone the imminent conclusion. Occasionally you’ll even find players conspiring with each other to make sure that they draw from the best stocked piles of ships. It would be going too far to say this adds an element of diplomacy to play, but it certainly adds a strategic layer that can be as interesting to leverage as any other part of the game. That’s all there is to it, and while the raw building blocks of the game may not seem like much they combine in a way that offers a great deal of calm, meditative enjoyment with occasional moments of teeth-grinding frustration. You don’t get to simply place boats wherever you like – come on, you know that’s never going to be how it works. Instead, you have to continue a chain of boats by starting it with another boat of the same colour, and then stretching out your ships in an unbroken line until you’re done. You get to bank one of the boats you have in your harbour, but this chain mechanic is the alchemy that transmutes simple play into genuine engagement because of how it interacts with the adjacency rules for all other actions. You can claim culture tokens, but only if you placed a boat in an adjacent waterway. You can place buildings on empty islands, but again only if you placed a boat in an adjacent waterway. That creates the circumstances where you might very well see the configuration of boats that would let you claim a tile, but be completely unable to do so because all the spaces are allocated. Opportunities float away like the unattended ships you merrily discard in your wake. It’s more complex than that still because of those fleet powers to which I briefly alluded earlier. Some of these let you move ships from one space to another, perhaps freeing up the space you need to slip in and claim the island for yourself. Some let you swap two ships anywhere in the board, turning an island that doesn’t meet the pattern requirements into one that does. Some let you place sacred space tokens that basically say ‘If I can’t have this, nobody can have it’. Each fleet token gives you a ship with which you can make a move, but they also give you special opportunities. The problem is that each fleet tile also comes at a cost. The number at the bottom represents the positon you’ll take next round on the turn track, and the more powerful a tile is the more punitive it’s going to be for you. I love this system because it adds a real sense of elasticity to the tactics of play – you might be able to pick the best, most powerful tile but whether it’s the right choice for you depends on what happens two or three rounds down the line. There’s no point laying out the perfect path to an island if you’re going to be the last one that gets to take advantage. Picking the right boat for a low point tile might not be worth it when you can pick the ‘wrong’ boat and get two turns back to back next time. This system encourages players to think of the game as more than a simple ‘Ticket to Ride in the water’ and moves it into something where deeper tactical appreciation yields substantial rewards. More too, it permits for defensive play by anticipating the optimal path an opponent might take and ensuring you remove the route to it. This is nice from a strategic perspective, but it’s also nice in that it adds a variable texture to a game experience that might otherwise be quite formulaic. Your turns ebb and flow like the waters that lap against the islands over which you compete. Getting awful crowded in my sky… sea. The boat chaining mechanic too offers a lot of opportunities for skilful play if you can get your head around the possibility space. Waterways in Yamatai are either part of a set path or junction points, and by positioning a colour carefully at a junction point you can have a powerful impact on how the rest of the routes evolve. The need to begin a path with a compatible colour results in the regular emergence of position puzzles – where you know what colour you need but not how to arrange it. You often need to consider the tools you have available and how to chain them together to get the right boat to the right place without doing yourself long term damage. 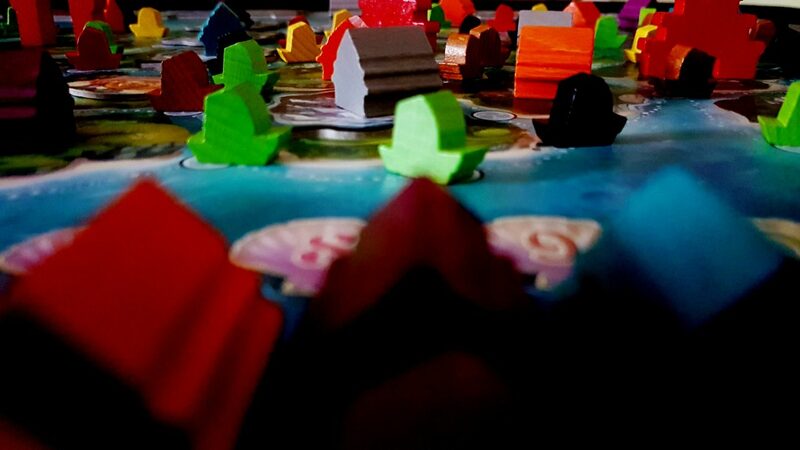 Where Five Tribes is almost pathological in the openness of its possibility space, Yamatai offers the same deep, rich and meditative experience within a more tightly constrained region of the board. You’re not thinking ‘How do I use all of these things, across all of these tiles, across all of these meeples, to get the optimal points reward?’. That’s a fascinating question and it’s what powers Five Tribes into the stratosphere if you are a fan of the design. 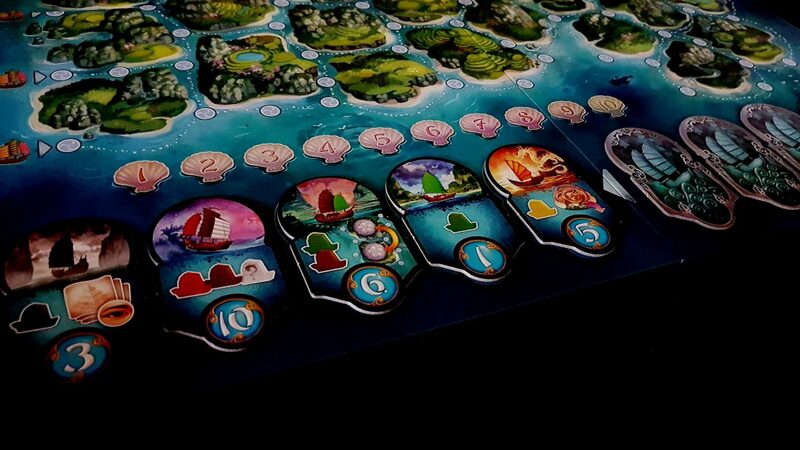 Yamatai though sets you an obvious goal and relentlessly focuses your attention on achieving it. You can discount most of the board in this cogitation because it simply isn’t relevant most of the time. As such, while Yamatai inspires the same kind of deep, rigorous contemplation it doesn’t tend towards the same intensely glacial pace of play. ‘Analysis Paralysis’ (urgh) is still a feature of the game but where it is a wild, untamable beast in Five Tribes it’s a comparatively sedate stallion in Yamatai. There will come a point where you can confront it without fear. The design of the game too permits you to effectively build a toolkit that plays to your strengths. Specialists are the ‘plug and play’ powers available to you in Yamatai and they’re relatively easy to get without necessarily disadvantaging yourself in the process. You cash in culture tokens to pick these up, and every round the unclaimed specialists increase in value through a Small World style mechanic of accumulating bonus coins until they reach a desirability tipping point. They offer victory points sure, but the special abilities they offer are the real appeal to most players. Izangi lets you buy or sell two boats per turn instead of one – that instantly creates pressures on your economy but also gives you a spectacular degree of positional flexibility. Maybe though if you grab Michimata (discard a culture token to receive a gold boat) and Tomoe (sell gold boats for five coins) you could have enough income to really make use of that extra trading power. Alternatively maybe you want Riu (gives you three harbour spaces instead of one) so that you can regularly bank the extra ships you can buy for when they are more useful to you. If the specialists are available, and if you use them wisely, you can perform minor miracles every turn that would be game-breaking if everyone else wasn’t similarly developing their own shipwright superpowers. Pauline has acquired Ebisu (gets to take an extra culture token from anywhere on the board when clearing) and Hetsuka (discard a culture token for four coins). She’s using them to fund Kachiko (spend two coins to remove a sacred ground token). Essentially she can claim islands freely with sacred ground actions, and only she is able to use those islands later. It’s like only one person can call dibs on the islands, and the Gods themselves have decreed that person isn’t going to be you. That would be infuriating if it wasn’t for Jasmine using Toyo Tama (any empty spot on the border of the board is an entry spot for boats) to gain access to tokens nobody else can even touch, and then using them to buy all the specialists that give bonus victory points at the end. You don’t have time to get upset at Pauline because you’re too busy being upset at Jasmine. It’s difficult to set up these synergistic chains, and if someone notices you doing it they’ll almost certainly do what they can to prevent it. However, powerfully interrelating abilities often cohere with multiple specialists. You’re almost always able to give yourself the ability to do something cool and have a firm enough goal in mind that you can see how to use that coolness to make good things happen for you. So! You’ve got all sorts of meaningful tools within a game state that is deep but tractable. You’ve got meaningful layers of strategy at every level of the game, from the choice of your action to the timing of the game’s termination. You’ve got a board that is beautiful to look at and multiple strategies that can lead to a win. You’ve got everything really that you can want in a game like this, so it’s a shame that in the end the experience doesn’t really offer much more than a thoroughly pleasant diversion. Again, it comes back to how badly it suffers in comparison with its older, more critically acclaimed sibling. Five Tribes is an extraordinary game – one that I find myself quietly admiring in idle moments of distracted thought. Five Tribes bursts off the table into your mind and begins to settle itself in for the long haul. The deep, intense thinking needed for Five Tribes is occasionally exhausting – you can leave the table feeling like you just sat the world’s most complicated exam for the world’s least complimentary professor. In my experience though you never leave a game of Five Tribes feeling indifferent. There are those that hate Five Tribes – those that bounce so hard off of its design that it may as well as well be made of militarized rubber. It’s impossible to reasonably deny that Five Tribes is a very distinctive experience – it feels like it’s trying to do something largely independent of whether anyone would like it, and it achieves greatness as a result. Yamatai on the other hand reminds me of those albums resentful artists record in order to meet the barest minimum creative output needed to honour a hated contract. It’s technically accomplished, perfectly enjoyable, but it lacks the energy and sparkle that suggests anyone particularly cared about what they’re doing. It doesn’t feel vibrant. It feels sterile. 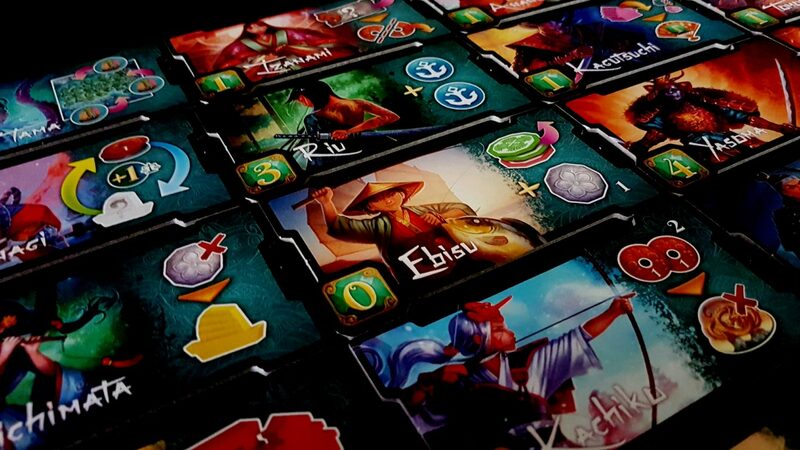 To put it in the language of Bruce Springsteen (which is something I think we should all do more often), Yamatai is Human Touch but Five Tribes is Nebraska. Human Touch is a more instantly likeable album, but it’s Nebraska – as cold, sterile, and unwelcoming that it is – that’s the real masterpiece. Or perhaps to offer a more generous comparison – Yamatai is George Harrison in the Beatles. In any other context he would have been the legendary genius songwriter everyone talked about whenever the band’s name came up. In the Beatles, his frame of reference included John Lennon and Paul McCartney. It’s hard to be the third best songwriter in a four-man band even if the first and second are almost universally considered to be two of the greatest that have ever lived. Yamatai then is the Second Best Band in America, and as such while you’ll enjoy the show you’ll always be thinking at the back of your mind that there are better ways in which you could be spending your time. It’s a good game, but it’s not good or adventurous enough to inspire anything but the most half-hearted passion in my blackened, cynical heart. 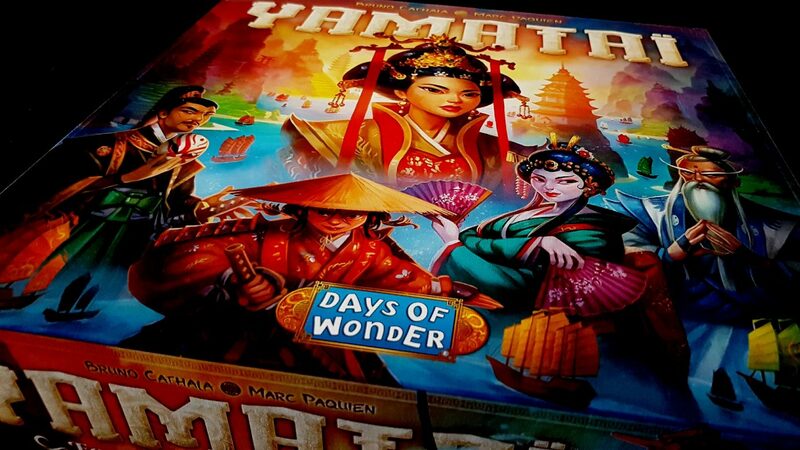 yet to play Yamatai but am looking more towards Five Tribes as my next purchase. I’m glad you reviewed both back to back as this has given me the insight that I needed! Keep up the good work. Love the Beatles comparison — it’s very apt. And as usual, I enjoy your writing.